Grammy® winning Jazz guitarist Lee Ritenour (aka Captain Fingers) celebrates his 40th anniversary since his debut album release in 1976. His latest release, a TWIST of RIT, is not a "best of" rehash of old tunes; it consists of 12 tracks of new and old favorites with a "twist and flip" released on the Concord Music Group label. 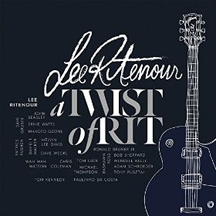 Lee Ritenour - a TWIST of RIT was produced by GRAMMY® Award-winning engineer Don Murray, arranged, and composed by Lee Ritenour for Captain Fingers Production, with Co-Producer John Beasley, and Executive Producer Mark Wexler on the Concord Music Group label. Throughout the years I have had the pleasure of listening to and reviewing many of Lee Ritenour's releases (Music Scene : Lee Ritenour - Rhythm Sessions, GRP 30: The Digital Master Company 30th Anniversary, Music Scene: Lee Ritenour's 6 String Theory), as well as interviewing him and watching him perform (Music Scene: Interview with Lee Ritenour, Music Scene: Performances: GRP Records - 30th Anniversary at the Blue Note in New York), and his nickname "Captain Fingers" is one that is well earned and deserved, the man is a guitar master. A TWIST of RIT is a celebration of Lee Ritenour's music, beginning with his debut release, First Course released in 1976 and includes a few choice cuts such as Wild Rice, Fatback, A Little Bit Of This And A Little Bit Of That, and Sweet Syncopation, as well as off his 1980 release RIT the track Countdown. Other great vintage cuts include Waltz for Carmen, off his 1990 Stolen Moments release and Soaring, off his 1986 Earth Run release. New music includes TWIST of RIT, W.O.R.K. N. It, and Pearl. The release opens with Wild Rice (First Course 1976) rearranged by Lee and John Beasley with a twist as they up-tempo the horn lines and give the arrangement a brash and funky sound. The track Fatback (First Course 1976) has a 10-piece band accompanying Lee as they flip this track and bring a new sound to the string and horn sections livening up the feel and pulse of the arrangement. Also from First Course are the tracks A Little Bit of This and A Little Bit of That, a jazzy track that was rearranged to shake out the guitar work to complement the hot horn section, and the track Sweet Syncopation, an arrangement twist on this funky 9/4-time track that will have you steppin' out. Showing Lee's diversity the release features Ooh Yeah (This Is Love 1998) which is a laid back whimsical arrangement featuring the finger work elements that have become the Lee Ritenour style. From Stolen Moments (1990) is the track Waltz for Carmen, which Lee wrote for his wife and features Tony Pusztai from Hungary who won the 2014 Six String Theory Competition from over 500 entries and 72 participating countries. The title track TWIST of RIT is a little bit of funk, a little jazz, and a lot of Lee and the band as they use their musical "cool" and strut their way through this track and "get funky!!" Catchy baseline carries the band and complements some "get down" guitar passages. Other great tracks include from Friendship (1978) Bullet Train that carries a Brazilian samba beat, and from Earth Run (1986) the track Soaring with light Latin overtones and a moving guitar melody rendering a beautiful song. Along with TWIST of RIT other new tracks include W.O.R.K.N' It a rock and jazz fused track with a heavy baseline leading the way and Pearl a poignant track with tender guitar chords against the moving background cymbals and piano work. A TWIST of RIT is a musical journey through the Lee Ritenour song book and what a page turner it is with its diverse styles, tempos, and sounds from different eras and genres. Lee Ritenour has never shied away from a challenge and a TWIST of RIT is a winner. Websites where you can procure a TWIST of RIT are Amazon, iTunes, Universal Music, and Barnes and Noble. Listen to cuts off at www.LeeRitenour.com. Follow Lee Ritenour on Facebook at www.Facebook.com/LeeRitenourMusic. © August 2015. Luxury Experience. www.LuxuryExperience.com All rights reserved.